Create your own customized, fun-filled amusement park! 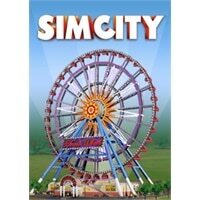 Build your park around your city's terrain and layout using amusement park paths. Your amusement park will benefit both locals and tourists alike as they fill your park, riding all the rides and shopping at the concessions. Take your pick from three themed entrances to bring Sims into your amusement park. Draw tons of tourists to your theme park city and watch them stay in your hotels and spend money in your shops! Three entrances to choose from: Funshine Park Entrance, Wheels of Wonder Park Entrance and Thrilland Park Entrance. Both young and young at heart Sims will enjoy classics like the Ferris Wheel, Carousel and Swings Ride. Speed demons and imaginary astronauts alike will find rides to enjoy with the Mini-Train Station, Go-Kart Speedway and Astro-Twirl Rocket Ride. Please the thrill-seekers with the Bigfoot Roller Coaster, Dizzy Drop Tower or Bluebeard's Pirate Ship.